This gadget holder actually gives me the creeps as I am not a fan of spiders or any creepy crawlers. The Breffo Spiderpodium can hold almost any portable gadget you might think of, by just manipulating it's eight Advanced Tech Rubber long legs which are soft to the touch, to your advantage. The Spiderpodium can also act as a tripod for your digital camera or even your iPhone 4 and other devices. The Spiderpodium is available in both black and white for $19.99. By now you should be very familiar with the company called Twelve South, a company which makes and designs products specifically for Mac users and Apple devices. The Compass is Twelve South's newest creation which is made out of heavy gauge steel and finished to match your iPad. The Compass is a foldable stand that is also very portable and allows you to display your iPad in both landscape and portrait modes. Also, the Compass has one more feature that allows you to angle your iPad for typing mode. The Compass is now available for $39.99 + free shipping. Heckler Design has introduced a beautiful metal stand for the Apple iPad called the @Rest. This stand will give you the option to angle your iPad in both 30 degree and 60 degree angles, plus you can position your iPad in both landscape or portrait modes. The @Rest's smartly designed resting pegs allow you to use your iPad with or without a case. 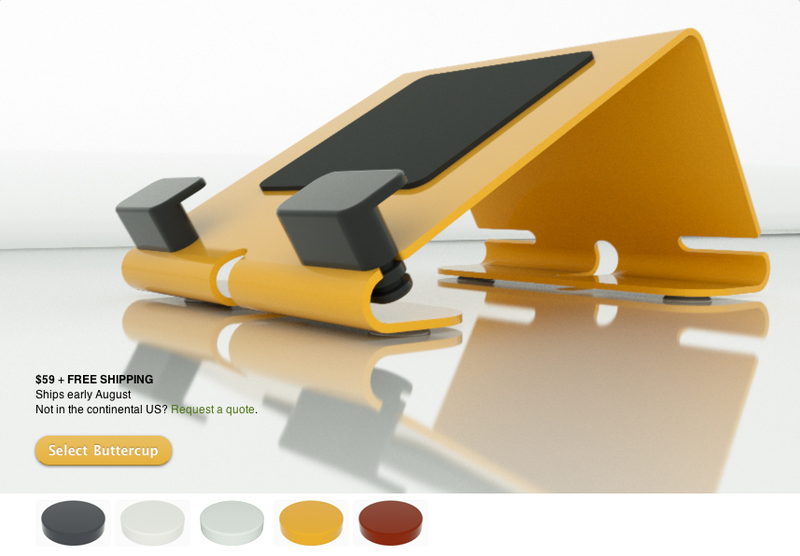 @Rest is available in five powdercoat color finishes. This might be the solid stand you're looking for, priced at $59 + it ships for free. @Rest is now available to order and will ship to customers in early August.